Long before Lenox was known for its tableware, the New Jersey-based firm was responsible for some of the most exquisite handpainted porcelain produced in this country, which is the subject of an exhibition Faces & Flowers: Painting on Lenox China, on view at the Mint Museum of Art in Charlotte through January 2010. This rare showing, drawn mostly from private collections, features more than 70 of the little known jewels made by Lenox China and its predecessor, the Ceramic Art Company (1889-1906). The plates, vases, and other wares decorated by European and American artists such as Bruno Geyer, William Morley, and Sturgis Laurence graced the residences of prominent citizens, including the orchid fancier Charles G. Roebling and the Newark industrialist Franklin Murphy, governor of New Jersey from 1902 to 1905. Guest curator and ceramics historian Ellen Denker and the Mint’s curator of decorative arts Brian Gallagher explain what is special about this exhibition, its objects, and Walter Scott Lenox’s innovative approach. The small but lavishly illustrated catalogue with an informative essay by Denker can be ordered through the University of Richmond Museums, which organized the exhibition (museums@richmond.edu or 804-287-6424). How did the idea for this exhibition come about? Ellen Denker: I have long wanted to exhibit painting on china as an art form separate from Lenox company history or general art histories of the era. When Richard Waller, executive director of the University of Richmond Museums contacted me about being the consulting curator for an exhibition of a private collection that featured the early china paintings of Lenox I was thrilled. We expanded the contents of the exhibition to include examples from several more private and public collections. What is your interest in china painting? Ellen: I’m interested in china painting because it’s a forgotten art. Art pottery and studio ceramics, in both practice and aesthetics, eclipsed china painting so completely in the 20th century that the importance of the earlier work and artists in defining the parameters of the new ceramic arts, building an audience/appreciation for clay, and establishing the nature of studio practice has gone unnoticed. Brian, what convinced you to bring this show to the Mint Museum of Art? Brian Gallagher: First and foremost, of course, the objects are visually stunning and superbly crafted, and I knew that our public would enjoy seeing them. North Carolina is a very big pottery state, and we have lots of local ceramics enthusiasts and collectors. Ceramics exhibitions are always very popular for us. In addition, although the historic ceramics collection at the Mint Museum of Art is one of the largest and most notable of our curatorial collections, Lenox is not especially well represented in our holdings. This exhibition presented an ideal opportunity for us to give our public a chance to become more familiar with one of America’s premier porcelain manufactories and see some of its superb creations. Ellen, you’ve had a long history with Lenox. Can you tell us something about it? Ellen: I began working on Lenox’s history in 1985 at the request of the company, which was anticipating its centennial in 1989. I prepared a detailed company history and from that we created a centennial exhibition for the New Jersey State Museum in 1989. We also created a publication to accompany that exhibition, which is a rare book today (Lenox China: Celebrating a Century of Quality, 1889-1989). During the research process I established the company’s archives and tended it for many years. That material has now been passed on to the Newark Museum, New Jersey State Museum, and special collections at Rutgers University, and is available to the public. What is special about this particular exhibition? Ellen: This exhibition focuses specifically on the painters that worked for Walter Scott Lenox from the founding of the Ceramic Art Company in 1889 into the 1930s, when the market for china painting waned. Brian, can you tell me something about the presentation at the Mint? Brian: Ellen did such a wonderful job choosing which stories to tell about the objects that I saw no need to veer from the path she had created. Of course, our installation looks very different from the exhibition’s previous venue—the Lora Robins Gallery at the University of Richmond. In Richmond, the exhibition was installed in a large, fairly open space, which allowed the visitor to see virtually all the objects in the show from a single vantage point and thus be suitably impressed by that visual feast. At the Mint, the exhibition is installed in three small, contiguous galleries, which requires one to progress from one gallery to the next in order to see all the objects. So while we are not able to offer our visitors the wonderful panorama that Richmond did, I think our installation allows one to engage with the objects in a more intimate setting. The catalogue states that Walter Scott Lenox’s approach to ceramics was revolutionary. What made it so? 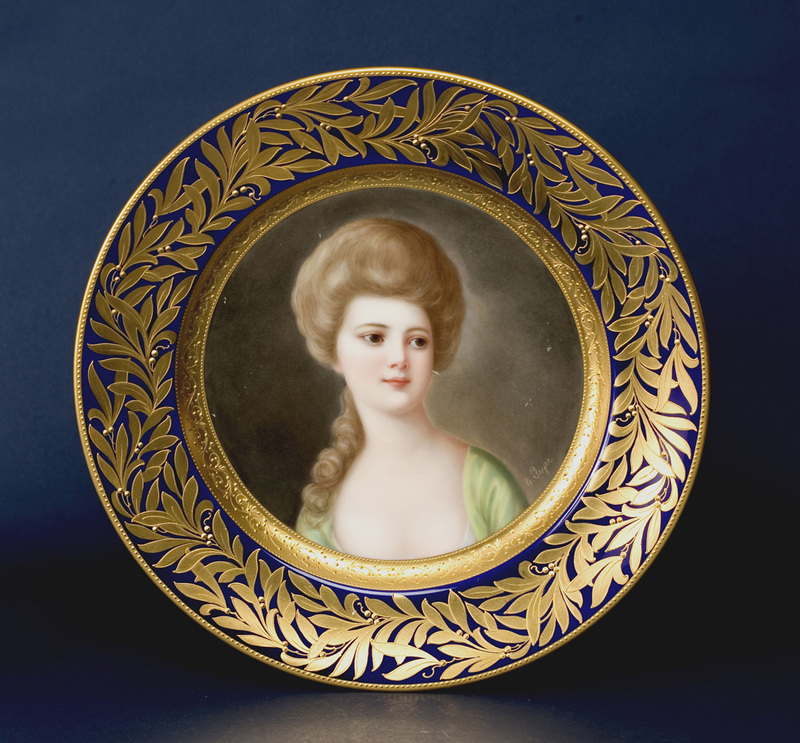 Ellen: Lenox believed that an American pottery could prosper with art objects as its only product. No other American company had previously had that goal. The American potteries where important ceramic art was being produced (Ott & Brewer’s Etruria Pottery and Willets Manufacturing Company) supported their small art studios with the production of large quantities of crockery for dining and sanitation. Lenox’s operation consisted of about fifty clay workers, painters, and decorators who created ornamental wares for exclusive customers in America’s key cities. Can you tell me about the painted images. Why they were chosen? What were their sources? Ellen: Most of the images on the china were painted from popular published sources, but we don’t really know whether the customers or the artists chose them. What do we know about the artists and craftsmen responsible? Ellen: Most of the painters who worked for Walter Lenox came from European factories in Bohemia, Austria, Spain, and England. Please tell me something about the process of creating these works. Ellen: As far as we can tell at present, all work was created on commission. Customers worked with a luxury retailer, such as Tiffany’s in New York City, choosing the size and form they wanted and possibly also requesting certain imagery. The order was conveyed to the pottery and then to the painter. Painters had studios at the factory or worked from their own facilities. Other decorators added the ornamental borders. Colors were made from metallic oxides ground to a fine powder and mixed with an aromatic medium that could be painted on the china surface, but the raw color was not necessarily the color that emerged from the fire. China painters had extensive knowledge of the color transformations of these metallic oxides. In addition, each color used on an object had its own perfect firing temperature. The painter and decorator started with the color that required the most heat to mature and worked down to the color that took the least. A single object might be fired many times in order to fix the colors, enamels, and gilding. The gilding seems particularly extraordinary. Can you tell me something about it? Ellen: Enameling and gilding were separate crafts from painting. Lenox’s workshop included all three craftsmen, although we know little about the enamellers and gilders. They seem to have been highly skilled artisans who were recruited from European and English potteries. How were these pieces marketed? Ellen: A few trade catalogues were published by the company, but these featured the china shapes. As far as we can tell all work was commissioned by retailers who ordered the work at customers’ requests and perhaps also on speculation for sale in their showrooms. Generally speaking, these were retailers of luxury goods for domestic use (silver, fine china, crystal), such as Tiffany’s in New York City, Bailey, Banks & Biddle in Philadelphia, Shreve’s in San Francisco, Marshall Field’s in Chicago, and so forth. Were they made in great numbers? Are they available on the market today? Ellen: This material was rare and expensive when it was made and is even more difficult to find today. However, the market for the work is just beginning because so few collectors know about this material. Ceramic Art Company/Lenox China’s art production compares favorably with the work of the best European and English factories from the same period. As collectors become familiar with the American work the market should open up. Brian: As mentioned earlier, we do not currently have a lot of early Lenox in our collection, and so I would like our visitors to come away from the exhibition appreciating just how incredible the factory’s products were in its first few decades. I think that many people who know the name “Lenox” recognize it from the company’s dinner services. These are certainly well made, but they are mass-produced. This exhibition makes abundantly clear that in its early years the name “Lenox” stood for unique, beautifully decorated porcelain objects made for the highest echelons of society in America’s Gilded Age. Ellen Paul Denker, guest curator of the exhibition, is a museum consultant and author of many publications on American ceramic history. Brian Gallagher is curator of decorative arts at the Mint Museum of Art in Charlotte, North Carolina.